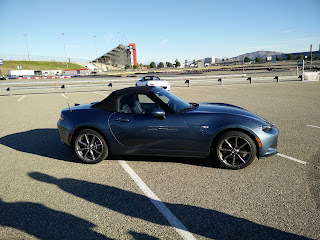 The Miata's chassis owes much of its fun factor to the extremely short wheelbase. The NB generation car, which is the one we owned, had a wheelbase of just 89.4 inches in length. It certainly made for an intimate passenger cabin, but also carried the benefit of extremely go-kart-like handling. Now, imagine stretching that chassis enough to be able to squeeze a usable pair of back seats into it. Say around 12 inches or so to a length of 101.4 inches. Sure we would be sacrificing a bit of the go-kart handling for the extra space, but considering that the current generation Mazda 3 comes in with a 106.3 inch wheelbase and still handles decently, I think there is room to add a few inches to the wheelbase without losing the go-kart character entirely. Width wise, the Miata has always been a bit snug and with the stretch in the wheelbase, I think it is necessary to widen the car a bit to ensure that the overall proportions do not look too odd since stretching the wheelbase means stretching the length of the car as well. The added length and width will inevitably increase the weight, but using some of the techniques that Mazda applied to the latest Miata, it should be possible to keep the weight below 2,700 lbs, even with a metal roof and an extra pair of seats. Plus, the solid roof should contribute substantially to reinforcing the cars structural rigidity, further improving the handling. For the exterior design, I am imagining a simple design drawing on the Miata as inspiration, but offering more of a four-door fastback in order to allow for a little more cargo capacity than a traditional three box sedan profile. Think more along the lines of the Audi A7 or Porsche Panamera, but on a much smaller scale. Unlike the Miata, the sedan would only be available as a hard roof sedan and no sunroof would be available to keep the weight down. 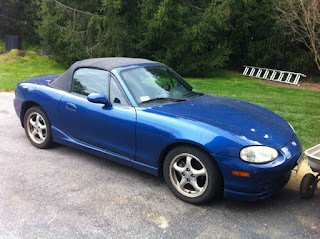 Of course, what has always made the Miata such a joy to drive is the suspension. Double-wishbones front and rear need to stay along with options for upgraded dampers as well as a limited slip differential and a six-speed manual as standard. Keeping the Miata's current equipment and trim levels pretty much the same should allow for sharing of components. Things like the wheels, tires, shifter, steering wheel, front seats, infotainment system, and many other interior trim bits can simply be lifted from the Miata while the rear seats can probably be borrowed from the existing Mazda parts bin with minimal changes. Power is going to be something that will likely spark some controversy. I believe in the Miata's formula of modest power around a light weight chassis, but that power level is likely to leave some potential owners wanting. Much like there has been some debate around the Toyota GT86/Scion FR-S/Subaru BRZ having only 200 hp, I would expect a small RWD sedan with such a low power rating to draw some serious flak. However, given that the current generation Miata carries 14.5 pounds for every horsepower, a 185 hp motor is all that would be needed to maintain that same power to weight ratio if the weight is held in check. That falls squarely in the power band of Mazda's existing SkyActiv 2.5L engine which already has a slick shifting 6-speed manual transmission available for it. Perhaps with a few upgrades, the engine could be made to produce slightly more power to offer a tad better performance to make it more appealing while still delivering fantastic fuel economy. Price wise, the Miata is not an inexpensive car. The basest Miata one can buy in the US costs a not insignificant $24,915 before destination and goes all the way up to a whopping $31,570 if you load it up to the gills with options. I would expect a sedan to add maybe $1,000 or so to that price. Those prices mean that the car competes with other cars that offer much greater straight line performance, such as the Focus ST and Subaru WRX, or much greater comfort, such as the Accord and even Mazda's own 6. However, the combination of a thrilling and raw driving experience with RWD handling dynamics in a super lightweight chassis is a unique one to this class. In fact, at the current moment, there is not another compact lightweight RWD sedan available at all in the US market. Just as the Miata appeals to a rather unique class of buyer, I would expect a lightweight RWD sedan to share many of the same types of buyers. People seeking that purity of driving, but with a need for greater practicality because they are limited to only a single vehicle. That more discerning buyer is willing to pay a little more to get just what they want. Sure there are plenty of FWD based competitors, but none of them offers nearly the same kind of performance credibility that a Miata derived chassis can provide. And while Mazda had introduced a similar lightweight four-seater in the past in the form of the RX-8, that had difficult to use suicide rear doors and was saddled with atrocious fuel economy and serious reliability issues because of the Renesis rotary engine. By taking a motor that already produces solid power and fuel economy, combining it with an extremely tossable chassis, throwing in a satisfyingly solid manual transmission, and giving it proper RWD driving dynamics, I think Mazda could really find a unique niche where there are basically no competitors at the moment. So Mazda, if you are listening, I would love to hear what you think about the possibility of producing such a car.